This tutorial is for frustrated amateurs -- people who take pride in the quality of their work but who don't know jack about sound systems. I'm not posing as an expert, just someone who had to learn this the hard way -- without a teenager by my side. Stumble It! Remember the microphone that came with your computer...? Ever wonder what you're supposed to do with it? For some reason this is a well-kept secret. 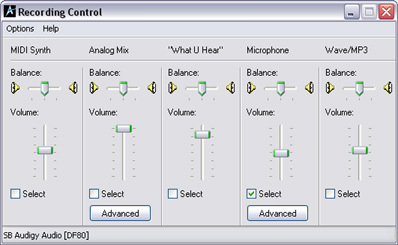 If your Volume Control is visible in your system tray, open it. Otherwise, Start > Accessories > Entertainment > Volume Control. When the Play Control window appears, choose Options > Properties. In the Properties window, click the radio button for Recording. Make sure the volume controls are checked for "Microphone." When you click OK, the Recording Control window appears. Ah, finally. Here's where you select the source for your recording. Check "Microphone." 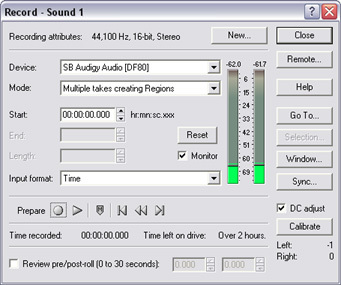 Open your sound recording software (yes, it's already part of Windows). Start > Accessories > Entertainment > Sound Recorder. Either MUTE your sound or plug a headset into your computer's earphone jack to avoid feedback and monitor yourself. Press the red Record button at the far right and start talking. You should see your voice print on the green line. When you're done, press the square Stop button. Hit Play and you'll be thrilled to hear your crappy distorted voice. Click File > Save and you can save it as a .wav file. Some editing is possible. Note: There is a 60-second limit to Microsoft's Sound Recorder (though you can Google for workarounds). The software that came with your sound card might have a more useful recorder. Your voice sounds crappy because the microphone is cheesy and there is all kinds of noise and interference coming from the computer itself. Doing it on a laptop may be better, if you can find a quiet room. If you're serious about this stuff, use Method 2. Go buy a Sony Minidisc player with recording capability. Make sure it has a mic jack. Minidiscs are so 20th century as MP3 players, but still highly prized by audio students and professionals for the high quality. You may be able to get a good one used. Take your script and this equipment to an quiet bedroom and shut the door. My bedroom, at least, makes a good recording studio because all the clothes, wall hangings, blankets, and carpet absorb undesirable reverberation* and there is no background hum of electronic devices. Wear a headset. Not only does it look cool, but you can monitor your voice as you record. This also works with a regular old tape recorder or with a digital voice recorder. One thing I've learned is that it is better to get the clearest sound possible in the first place than to try to clean it up in a sound editor. The pros use minidiscs or digital tapes. Professional equipment gives you more control and more visual cues about recording levels. Once your sound is on a disc you're faced with getting it into the computer. This is so easy that no one bothers to mention it anywhere. Therefore it became a major challenge for me to figure out. The answer: get a cord with mini-stereo plugs** on both ends. Plug one end into the minidisc headphone jack and the other into your computer's microphone jack. Ta-dahhh. 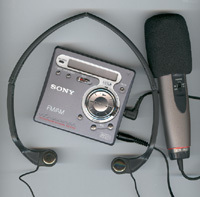 From there, you can use the MS Sound Recorder if you must, using the recording instructions from above. Playing the recorder is the same as speaking into the microphone, but without all the ambient noise. If you want any control over the end product at all, get yourself a decent sound editing package. Audacity is free and gets lots of praise. I'm sure there are good low-cost or shareware packages out there, but I got hooked on Sound Forge by Sony. You can download their entry-level Audio studio for $69.95. With your recording device connected,*** you open a new sound document in Sound Forge (or whatever). Hit the Record button and the Record dialogue opens. Before you hit the Record button here, play your disc. If everything is set up right, you should see the Monitor responding to the sound. If the green bars bang up against the top and turn red most of the time, it means your volume is way too loud. Start over and adjust the player volume or the volume in the Microsoft Recording Control window. Keep at it till you get it right. Better to err on the side of too soft rather than too loud. When you thinks it's right, press Record. If you Close the dialogue and the resulting sound graph is very tall and cut off flat at the bottom and top, that's a sign that you've recorded too loud and you've lost quality. Sometimes the sound pattern is too flat. This is less catastrophic -- I've had pretty good luck boosting the volume of soft recordings. Once you have your sound captured in Sound Forge and the sound wave looks pretty, save the document and start playing. First order of business is to cut off long silences at the beginning and end. Then you can go through and cut out any glitches or false starts. I usually save this cleaned up version and do my experimenting and final edits on a copy. Record, with or without an exernal mic. Pop out the SD card. Put it in a little card reader attached to your computer. (I use a little Sony 17-in-1 Memory Card Reader . Pick these up at any electronics store, along with extra SD cards.) A card reader will look like another drive on your computer. Copy your sound file to your hard drive. Open your sound editor and have a ball! No sweaty process of playing your sound into the computer via cable to your sound card! Was this helpful? Got anything to add? Contact Stumble It! *...Sound recorded with as little "room tone" as possible (e.g., no reverberation off hard surfaces) is referred to as "dry." When you add effects later is becomes "wet." **...Stereo plugs have two colored stripes on them; mono, only one. ***...Using your microphone jack to capture sound from your recording device is okay, but sound pros would recommend using the Line In jack on your sound card. If you do this, after you get off your hands and knees and turn off your flashlight, don't forget to change the sound source in the Recording Control window.